Prominent & Leading Manufacturer from Ahmedabad, we offer pigment for dyeing and printing industry. Backed by the skilled workforce, we are involved in offering a quality range of Pigment for Printing Industry to meet the needs of our customers. The entire range of our products is manufactured using high grade components and advanced technologies that ensure longer reliability and durability. Pigment for Printing Industry is offer trouble-free performance. 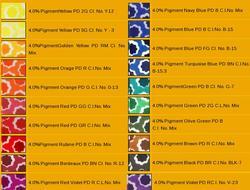 Moreover, pigments are checked on certain quality parameters, and ensure their flawlessness. Looking for Pigment for Printing Industry ?